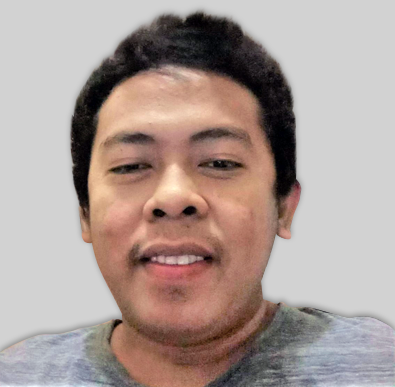 Hi, I had a form that included the Take Photo widget. It worked fine for a couple of days, but recently came up with an error message and is not working anymore. 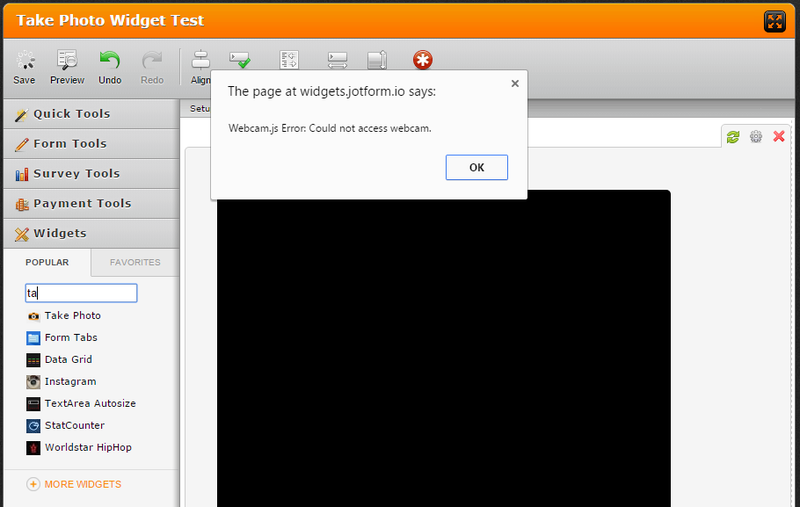 It says "webcam.js Error: Could not find webcam." Are there any troubleshooting tips you can help with on this? I also notice that the prompt where jotform wants to use your camera with options to allow or deny is not coming up anymore. 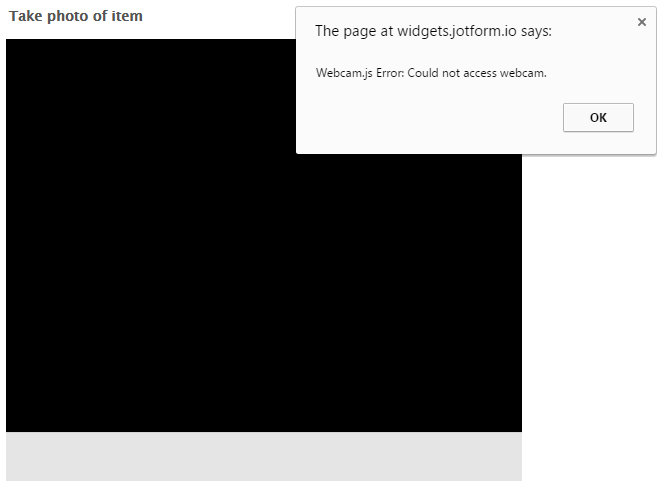 To my understanding you are reporting a problem with the Take Photo Widget giving you an error since after a couple days it was unable to find your webcam, correct? I see that you are having this issue on this form http://www.jotform.us/form/53336660320145. Thank you for reporting this issue to us as I have tested this problem thoroughly now including a separate test and I'm able to replicate the issue. I've forwarded this to our Widget Team to get it fixed asap. Additionally, I would like to notify you that on your form I found you have two fields asking for a Username and Password which is not allowed because it violates our Terms of Usage. These two fields are are asking for sensitive information. Please see https://www.jotform.com/terms for details. I have removed the fields in violation for you to allow your form to continue being used by you and also to allow our developers look and fix the initial issue involving the Take Photo Widget. However, be advised that using such in the future will result in suspension of your account. Hi, If you are using Google Chrome they made it a strict requirement that a certain website must be secure (HTTPS) if we want to use or access the camera. This change is live in Chrome version 47 and up. So basically, all you have to do is to make your forms secured (SSL). For example if your form is http://www.jotform.com/form/53336660320145 make use of https protocol like so https://www.jotform.com/form/53336660320145 . See this Chromium page for details. Below you can see the supported browsers of the widget and how it should work with HTTPS pages. I followed your advice and was able to get the take photo widget working on the jotform site again. However, when I went back to my website with the updates, I suddenly couldn't use the next button to go to the next page. I changed to using the iframe code to see if that would work better. It did-marginally. I can now go to the next page, but everything is missing besides the photo widget and the photo widget is pitch black. Any ideas? I have moved your next question here http://www.jotform.com/answers/721940. We'll be on it shortly.